When bees or wasps sting a person, they inject venom through their stinger into the skin of the victim. Wasps, yellow jackets, and hornets have stingers without barbs that are usually retracted upon stinging, and these insects can sting people multiple times. 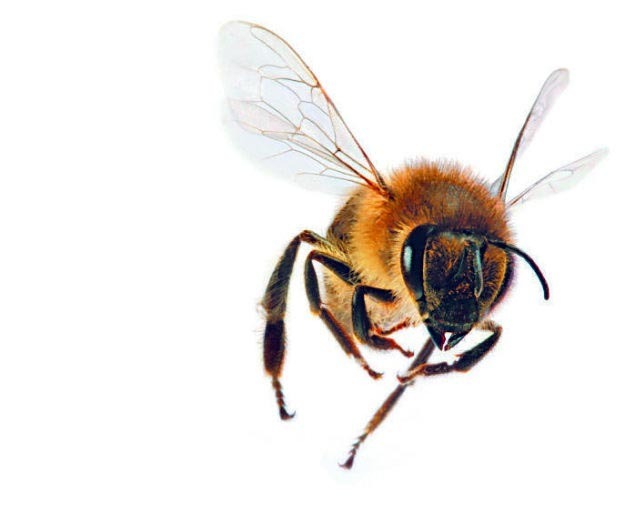 The honey bee has a barbed stinger that remains in the victim's skin with its venom sack attached. About 3% of people stung by bees and wasps have an allergic reaction to the sting, and up to 0.8% of bee sting victims experience the severe and life-threatening allergic reaction known as anaphylaxis. Most people will have only a localized reaction to a bee sting. In the normal reaction to a bee sting, the skin is reddened and painful. Swelling and/or itching may also occur, but the pain usually disappears over a few hours. In the so-called large local reaction to an insect sting, the swelling, redness, and pain may persist for up to a week. Areas adjacent to the site of the skin may also be involved in the large local reaction. In anaphylactic reactions, victims experience wheezing, difficulty breathing, and a drop in blood pressure that leads to shock if not treated promptly. Around 50 people are killed each year in the U.S. due to severe anaphylactic reactions to bee stings. These type of reactions usually occur within minutes of the bee sting. Since most people who have allergies to bee stings will have a worsened reaction to every subsequent sting, those individuals with bee sting allergies should talk to their doctor about taking special precautions, including carrying an injectable form of the drug epinephrine (used to treat anaphylactic reactions) at all times. Call emergency medical services if you have a history of severe reactions to insect stings or if you experience any severe symptoms as described above. Determine if the stinger is still present (look for a small black dot at the sting site) and remove it immediately if is visible in the wound. Many doctors recommend using a hard object like a credit card or blunt knife to swipe over the area and remove the stinger. The honey bee venom sack, which remains in the skin of the victim, can take 2-3 minutes to release all of its venom, so prompt removal of the stinger can reduce the severity of the sting. Apply ice or cold packs to the area to reduce the body's inflammatory response. Clean the area with soap and water, then apply hydrocortisone cream to the site to decrease the severity of the reaction. Alternative treatments include a paste made of unseasoned meat tenderizer and water (the enzyme in meat tenderizer can break down bee venom) or a paste of baking soda and water. Taking an antihistamine such as diphenhydramine (Benadryl) in tablet form and/or nonprescription pain relievers such as ibuprofen or acetaminophen can also provide relief of symptoms. Stings in the mouth or nose, even in persons not known to be allergic to bee stings, also require emergency medical attention, since they can lead to swelling that can interfere with breathing.